A series of decisive battles, involving title-aspirants, was in keeping with the expectations from the penultimate round. When the dust settled after some fierce fights on the top four boards, Aravindh Chithambaram emerged as the only leader heading into Tuesday s final round of the National chesschampionship here. Aravindh, last year s runner, overpowered a resurgent M. Karthikeyan, seeded two, and raised his tally to 9.5 points from 12 rounds. G.A. Stany, the other overnight leader, could not add to his tally of 8.5 points after running into C.R.G. Krishna. Vaibhav Suri rekindled his title-prospects by beating Deepan Chakkravarthy in 42 moves. Having already beaten top seed Abhijeet Gupta and third seed Suri, fourth seed Aravindh s latest victory meant he scored over all three higher seeds in the 13-round competition. The youngster now enjoys half-a-point lead over Krishna and Suri. Stany, Deep Sengupta, M. R. Venkatesh, Vishnu Prasanna and Sirjit Paul share the fourth spot with 8.5 points. Aravindh, playing black, gained early advantage in this Sicilian game with Karthikeyan losing a kingside pawn on the 21st move. Once the queens were off the board, Aravindh trained his rooks on the castled white king and gained a second pawn on the 41st move. Three moves later, Karthikeyan gave up. The defeat also dashed Karthikeyan s hopes of winning a third title in four editions. Krishna, too, needed 44 moves with black pieces to push Stany to his second defeat in the competition. Until the 30th move, the battle was fought on an even keel before Stany erred with his decision to push his king forward on the 32nd turn. Soon Krishna found a tactical shot, gained two more pawns following the exchange of rooks and his knight for Stany s bishop. Once Krishna thrust his well-aided central pawn to the sixth rank, Stany gave up. Leading results (12th round): M. Karthikeyan (8) lost to Aravindh Chithambaram (9.5); G.A. Stany (8.5) lost to C.R.G. 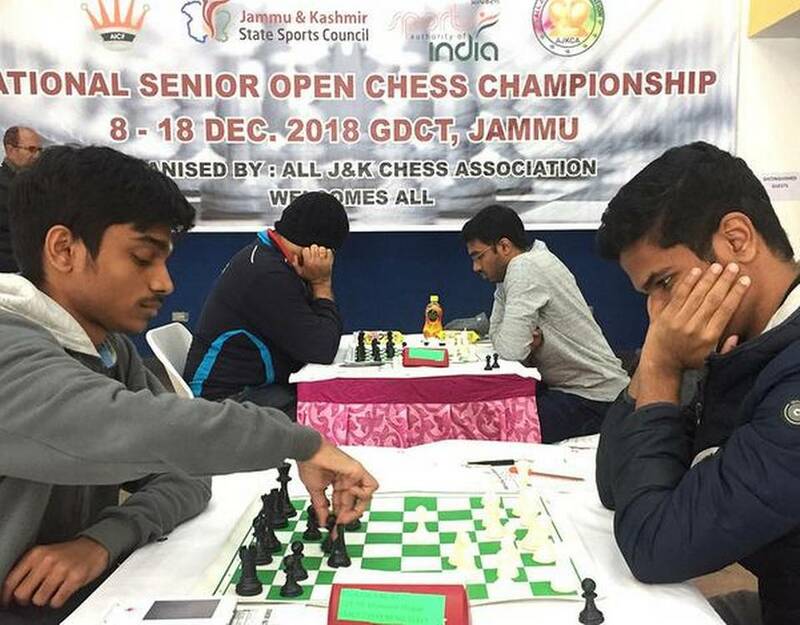 Krishna (9); Vaibhav Suri (9) bt Deepan Chakkravarthy (8); Deep Sengupta (8.5) bt Tejas Bakre (8). N.R. Vignesh (8) drew with Sandipan Chanda (8); M.R. Venkatesh (8.5) bt S. Nitin (7.5); P. Shyam Nikhil (8) drew with Karthik Venkatraman (8) Pravin Thipsay (7.5) lost to Vishnu Prasanna (8.5); Srijit Paul (8.5) bt Anurag Mhamal (7.5); Swapnil Dhopade (7.5) drew with G. Akash (8). Top-five final-round pairings: Aravindh-Krishna; Suri-Paul; Prasanna-Deep; Venkatesh-Stany; Akash-Murali Karthikeyan.